Professional - Make that all important personal connection every time with professional badges and IDs that reinforce your corporate or organizational identity. Include company or organizational logos, colors and even staff photos for recognition and impact. Your staff projects a friendlier, more professional appearance and are easily identifiable with our quality badges. 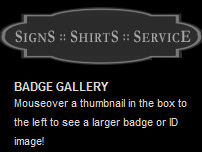 Religious or Church - We also specialize in religious or church badges. Your pastor, deacons, deaconesses, ushers, or any other special member of your church will be proud to be identified by wearing our badges. We can engrave one of our stock logos or use your custom logo on these badges along with the name of the church, city and state, name and title of the important representative of your group. Our badges come in many distinctive colors, sizes, and shapes. Whether you want just that simple single-line name badge or a unique full color badge, our staff will be glad to help you with your order.